Alarm clock buzzes. Feet hit the floor. Foggy thinking slowly clears to reveal the day’s list of activities. The mind steadily hits second gear and all of yesterdays worries pop up again like a whack-o-mole game! I heard Pastor Chris Hodges speak at She Speaks conference in April and he suggested to make a “not to do list”. I like it!! But in the rat race of life we’re not sure how to slow down. And then we just become hateful and angry because we want to have the peace and joy that rest brings. We can. We can have that joy even if we have crazy lives just by being grateful. The key to joy is gratitude. When we start being thankful for all the things we have we can’t help but find joy. Our brains trigger some chemical that brings this peace. A smile automatically comes to our face. Our physical demeanor relaxes and something inside of us twinges with excitement. That’s joy. What are you grateful for today? Start with the little things like a house to protect you from the rain. A fan or air conditioner on a hot day. Food to eat. Chocolate! Freedom to come and go as you please in this country. A job that, although is sometimes filled with annoying attitudes, provides money for expenses. Family. Physical health to get up each day. A Bible to read. A church to go to. A God who is in control of every last bit of everything! Salvation to know Him and a promise of eternity in heaven when you do. That is gratitude. And that, my friend, is the key to JOY. 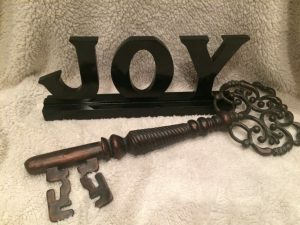 I pray you find the key to open the door to experience your JOY today. This entry was posted on August 23, 2017 with tags: #gratitude, #makeadifferenceeveryday, #pastorchrishodges, #shespeaks2017, joy, kindness by Deanna Young.